Since chiropractic care involves a series of visits, with each one building on the ones before, it’s important that our relationship can go the distance. As Chiropractors in Kentwood we’ve found that one of the best ways to have successful patient relationships is to explain everything in advance. No surprises! Your initial visit will last for about 60 minutes. You will begin with a warm greeting from our new patient assistant who will help you complete any paperwork, which will help the doctor to understand the nature of your complaints. After review of your health history, the doctor will examine you to determine if chiropractic care is appropriate for you and then explain why and how chiropractic works. Based on any necessary X-rays and findings, you may get adjusted that day or at the time of your report of the doctor’s findings, typically within 1-2 days of the initial appointment. After signing in and being greeted by our front-desk staff member, you will be taken to the exam room and the doctor will give you what is referred to as a “Report of Findings.” This consists of a colorful brochure filled with personalized information regarding your specific complaint that the doctor will explain to you along with details of what your treatment will consist of, and how much it will cost. If you are accepted for care at our office, your Kentwood Chiropractor will then give you a spinal adjustment and home instructions, if necessary. This may include icing, activity restrictions, stretching or suggestions for comfortable sleeping. If time is available and the doctor thinks it may be of help, you could get a 10-minute complimentary massage during this visit as well. A posture assessment is also performed at one of the first visits (unless pain prohibits) and the results will be given at the following appointment. This is included with your chiropractic treatment and is of no extra charge. Each visit begins with a greeting to you by our front-desk staff and with you signing in. We use ‘travel cards’ which will be given to you upon signing in. You will then be told which room to go by room number or you will be asked to have a seat at the end of the hallway and to enter the first room that is vacant. 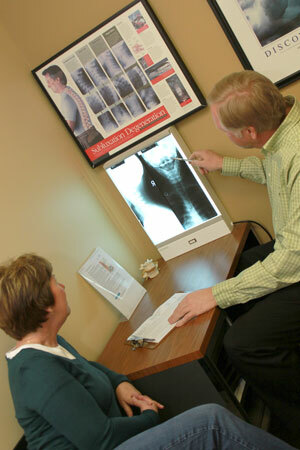 Dr. Wilcox or Bale will then review your progress, perform a brief evaluation and then adjust your spine. Any home instructions will be discussed and after a brief stop at the front desk to return your travel card and confirm your next appointment, you will be on your way.